Roaming the Countryside: Breakdown in Solola: (3) Get Out of My Way! I close my eyes shut tightly against the image of my children being pulled from the car and I drive my thoughts towards moments that ground me. 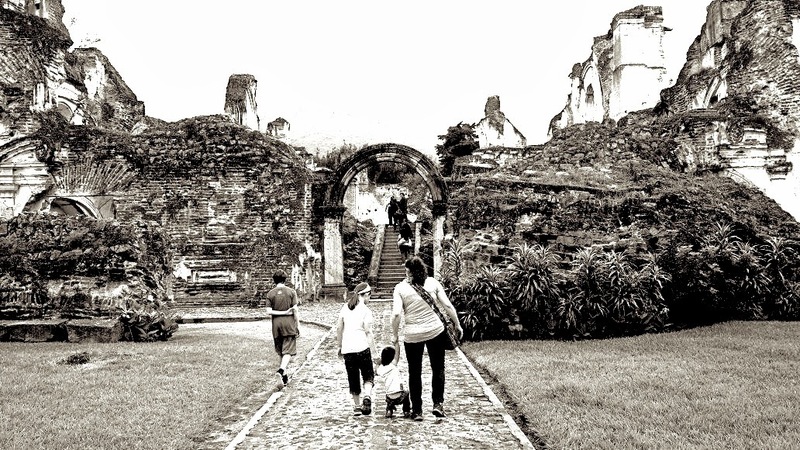 I think of the day we all found our favorite ruin when we took a wrong turn in Antigua. I remember taking this photograph as my heart burst with the floodgate collapse of realized happiness unexpected. Somehow I was so blessed to be in this place with such a beautiful family. I remembered thinking even then... but this is not promised. This is not guaranteed. Things could go dark. I remember locking that moment away deep in my heart as a reserve for a time such as this. Everything I held onto tightest was in this car. This car stuck immobile in this moment of time while my mind was realigned by this powerful memory. 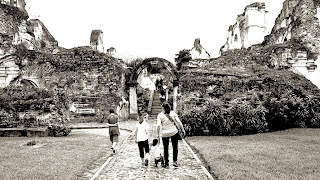 I found a sense of purpose as I visualized my families feet on the path heading towards the ruin. If today was to be our ruin... so be it. We are confident of the God who leads us. If today is to be our final day, then let me hit my knees on the stones of this narrow way. I looked back up with the man and told him, I am sorry... I thought the car was drivable. I am just trying to get home. He continues to insist that I coast backwards back into the thick of the town and he will find us a place to stay the night. I feel deep in my gut that this man is not to be trusted. I have this overwhelming conviction that if I take him up on this offer, things will not end well. I ask God for help. I have no answers. I need a miracle. I turn the key... the engine fires up... but will it GO? I place my foot on the brake, I slip the engine into drive... I take a deep breath and then SLAM my foot down on the pedal. The Terracan lurches forward with a roar! But people are everywhere. There is no clear path. I am convinced this is my one and only shot to get away from this place. I am convinced that everything depends on it. I slam my fist down on the horn, roll the windows up tight, and drive into the crowd. The people are frantically jumping out of the way and shoving others aside. I know now that without a doubt, I am offending and angering a crowd of people. I force my way into traffic, hearing other horns blast out and people are now yelling to others to get out of the way. We accelerate up the mountain pass as my tires squeal against the stone street while I jerk and weave between people on foot and vehicles in the street. I go from side to side, even driving into the gutter to avoid collision. We crest the top of the hill and begin driving out of the city. Solola is now behind us. I tear down the mountain pass in a concentrated and determined frenzy. My hands grip the wheel with determination and my mind takes in every nuanced curve and tilt of the pavement as I anticipate the bank of the narrow curves. I keep checking the rear-view mirror... convinced that angry men will be in pursuit. I can't imagine that we will get away. But as a few kilometers pass between our tiny family in that car... my breathing begins to deepen and my hands relax their grip on the wheel. We are safely rolling towards home. The mood relaxes in the truck and like anyone who gets through a tough spot, we begin to downplay the situation and even laugh about it. We come to the next climb in the road. The next few kilometers are a significant climb in altitude as we have to cross over another mountain to get to San Lucas. I hit the ascent with a powerful acceleration, and my heart starts to turn to ice in my chest as I feel our speed begin to slow. I press the pedal fully to the floor and the I began shouting, "NO, NO, NO... you've got to be kidding me! NOT. AGAIN!" We are on a narrow mountain pass. It is dark. We are on a steep angle on a blind curve. There is a rock wall to my right, a double yellow line in the center of the street, and traffic is coming down the mountain at high speed. The cars behind us can not safely pass. We can't go forward. We can't go backward. I hear tires screaming on the pavement and look up at the mirror. An old school bus used for public transportation is sliding sideways, into oncoming traffic, trying to avoid colliding into us. The driver is laying on his air-horn. My entire body tenses up. I shrink down into my seat and close my eyes as my head fills up with the demon shriek of screaming tires and the blasting horn.